Euro-American traditions of landscape art tend to work differently from those of Native peoples, often picturing the land from afar as a space to behold. 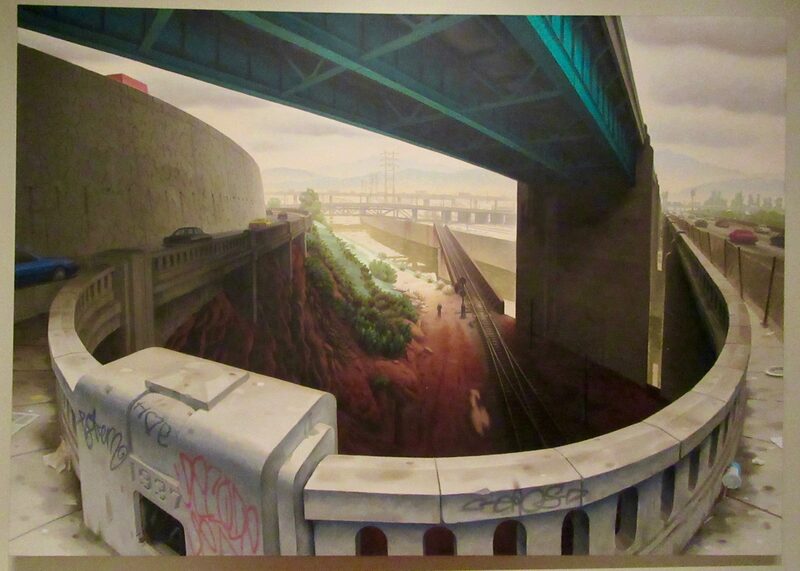 James Doolin (1932 – 2002) carefully studied the landscape to create Bridges (1989), spending a week at the off-ramp from the 110 Freeway to Interstate 5 in Los Angeles. Using principles that originated in European painting, Doolin designed an expansive vista in which a vast space is seen from a single vantage point. The small figure in the foreground — intended as a stand-in for the artist or viewer — also appears in many traditional landscape paintings. By applying these motifs to 20th Century Los Angeles, Doolin refers to the power of historical images in shaping our modern experience of place. Photographed in the Autry Museum of the American West in Los Angeles.